Pictured from left to right are San Diego Yacht Club Commodore Doug Werner, Jack Roman (Newport Harbor Yacht Club), Paulo Campbell (San Diego YC) and Marcus Hall (Mission Bay Yacht Club). SAN DIEGO — A total of 155 sailors participated in the 47th Dutch Shoe Marathon on San Diego Bay, racing on sabots from La Playa Cove to the bay and finishing in Glorietta Bay. This year the Dutch Shoe Marathon partnered with Race for Rady as a fundraiser for The Peckham Center for Cancer and Blood Disorders at Rady Children’s Hospital – San Diego. 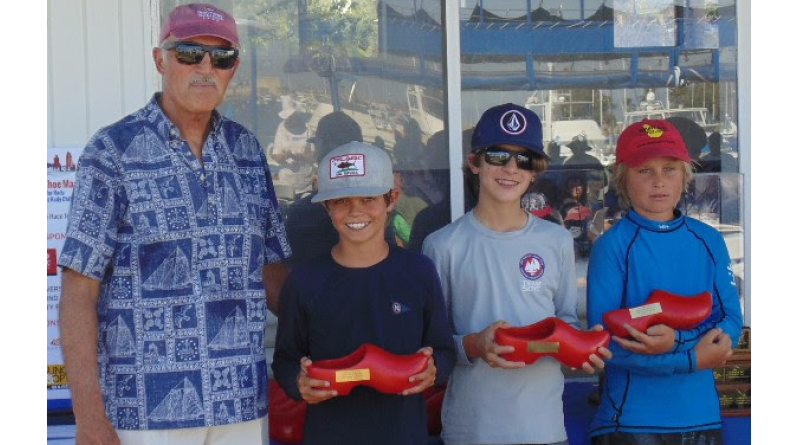 Race results: First overall: Jake Mayol, Bahia Corinthian Yacht Club; 2nd: Samantha Gardner, San Diego YC; 3rd: Morgan Pinckney, Newport Harbor Yacht Club; 4th: Chuck Sinks, San Diego YC; 5th: Dylan Gardner, San Diego YC. Class winners: A Class: 1st: Jake Mayol, Bahia Corinthian YC. B Class: 1st: Marianna Shand, Mission Bay Yacht Club. C Class: 1st: Samantha Gardner, San Diego YC. Senior Class: 1st: Chuck Sinks, San Diego YC. Race for Rady raised $40,000 for The Peckham Center. This brings the total raised by Race for Rady including the inaugural 2014 event to $110,000. Fundraiser results: 1st: Jack Egan, San Diego YC; 2nd: Jack Plavan, San Diego YC; 3rd: Piper Holthus, San Diego YC and Devon Owner. Fundraiser trophies were framed artwork created by children undergoing treatment at The Peckham Center and the 1st place fundraiser, Jack Egan, received a new Sabot sail donated by North Sails.